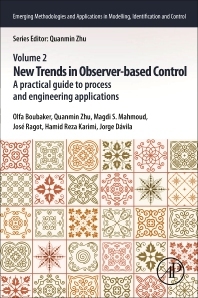 New Trends in Observer-Based Control: A Practical Guide to Process and Engineering Applications presents a concise introduction to the latest advances in observer-based control design. The book gives a comprehensive tutorial on new trends in the design of observer-based controllers for which the separation principle is well established. It covers a wide range of applications, also including worked examples that make it ideal for both advanced courses and researchers starting work in the field. This book is also particularly suitable for engineers who want to quickly and efficiently enter the field. Olfa Boubaker received the Ph.D. degree (2000) in Electrical Engineering from the National Engineering School of Tunis (ENIT) and the Habilitation Universitaire degree (2007) in Control Engineering from the National Engineering School of Sfax (ENIS), Tunisia. Since 1997, Professor Boubaker is a Permanent Visitor of the Laboratory of Analysis and Architecture of Systems (LAAS) of CNRS, Toulouse (France). She is currently Full Professor at National Institute of Applied Science and Technology (INSAT) of University of Carthage where she was actively engaged, since 2000, in teaching and research in Control theory, Nonlinear Systems and Robotics. Since 2017, she is the Head of the Research Laboratory ‘Energy, Robotics, control and Optimization’. Professor Boubaker is closely associated with several reputable international journals as a reviewer. She is Member of the scientific editorial board of the International Journal of Advanced Robotic Systems (SAGE publishing), Guest Editor for the journals Complexity and Mathematical Problems in Engineering (Hindawi Publishing) and Regional Editor of the Book series Emerging Methodologies and Applications in Modelling, Identification and Control (Elsevier Publishing). She also serves as scientific committee member in several international and peer-reviewed conferences. Professor Boubaker is the principal author of (03) books, (12) book's chapters and the author/coauthor of more than 100 peer-reviewed papers. Quanmin Zhu is Professor of control systems at the Department of Engineering Design and Mathematics, University of the West of England, Bristol, UK. He obtained his MSc in Harbin Institute of Technology, China in 1983 and Ph.D. in Faculty of Engineering, University of Warwick, UK in 1989. His main research interest is in the area of nonlinear system modelling, identification, and control. His other research interest is in investigating electrodynamics of acupuncture points and sensory stimulation effects in human body, modelling of human meridian systems, and building up electro-acupuncture instruments. He has published over 200 papers on these topics, edited five Springer books and one book for the other publisher, and provided consultancy to various industries. Currently, Professor Zhu is acting as Editor of International Journal of Modelling, Identification and Control, Editor of International Journal of Computer Applications in Technology, Member of Editorial Committee of Chinese Journal of Scientific Instrument, and editor of Elsevier book series of Emerging Methodologies and Applications in Modelling, Identification and Control. He is the founder and president of series annual International Conference on Modelling, Identification and Control. MagdiSadek Mahmoud obtained B. Sc. (Honors) in communication engineering, M. Sc. in electronic engineering and Ph. D. in systems engineering, all from Cairo University in 1968, 1972 and 1974, respectively. He has been a professor of engineering since 1984. He is now a Distinguished Professor at KFUPM, Saudi Arabia. He was on the faculty at different universities worldwide including Egypt (CU, AUC), Kuwait (KU), UAE (UAEU), UK (UMIST), USA (Pitt, Case Western), Singapore (Nanyang) and Australia (Adelaide). He lectured in Venezuela (Caracas), Germany (Hanover), UK ((Kent), USA (UoSA), Canada (Montreal) and China (BIT, Yanshan). He is the principal author of forty-six (46) books, inclusive book-chapters and the author/co-author of more than 580 peer-reviewed papers. He is currently actively engaged in teaching and research in the development of modern methodologies to distributed control and filtering, networked-control systems, triggering mechanisms in dynamical systems, renewable-energy systems, and information technology. He is a fellow of the IEE, a senior member of the IEEE, a member of Sigma Xi, the CEI (UK), the Egyptian Engineers society, the Kuwait Engineers society and a registered consultant engineer of information engineering and systems (Egypt). José RAGOT received the "Diplome d'Ingénieur" (Engineer Degree) with specialization in control from the Ecole Centrale de Nantes (France) in 1969. Then, he joined the University of Nancy (France) where is received the "Diplôme d'Etudes Approfondies" (Master Degree) in 1970. In 1973 he obtained the "Diplôme de Doctorat" (Ph. D. degree), a position as assistant professor at University Henri Poincaré in Nancy, and in 1980 the "Diplôme de Doctorat-es-Sciences". José Ragot moved up to professor in 1985 at the Institut National Polytechnique de Lorraine (INPL, National Polytechnic Institute of Lorraine). His major research fields include data validation and reconciliation, process diagnosis, fault detection, and isolation. Another part of his activities is devoted to modelisation and state estimation adapted to process diagnosis and mainly in the field of multi-models. Prof. Ragot is a researcher in the "Centre de Recherche en Automatique de Nancy" (CRAN, CNRS UMR 7039) where he was the head of the group "process diagnosis" during 12 years. Presently he is an Emeritus Professor (with the degree "Classe Exceptionnelle") at the "Ecole Nationale Supérieure de Géologie" (french "Grande Ecole") where he has been in charge the formation in automatic control. Dr. Karimi received the B.Sc. (First Hons.) degree in power systems from the Sharif University of Technology, Tehran, Iran, in 1998, and the M.Sc. and Ph.D. (First Hons.) degrees in control systems engineering from the University of Tehran, Tehran, in 2001 and 2005, respectively. His research interests are in the areas of control systems/theory, mechatronics, networked control systems, intelligent control systems, signal processing, vibration control, ground vehicles, structural control, wind turbine control and cutting processes. He is an Editorial Board Member for some international journals and several Technical Committee. Prof. Karimi has been presented a number of national and international awards, including Alexander-von-Humboldt Research Fellowship Award (in Germany), JSPS Research Award (in Japan), DAAD Research Award (in Germany), August-Wilhelm-Scheer Award (in Germany) and been invited as visiting professor at a number of universities in Germany, France, Italy, Poland, Spain, China, Korea, Japan, India. Jorge Dávila received the Ph.D. degree (2008) in Electrical Engineering from the National Autonomous University of Mexico (UNAM). He was awarded the Alfonso Caso Medal to the best Ph.D. student of the National Autonomous University of Mexico, UNAM, in 2010. Prof. Dávila is a member of the Mexican National Research System, since January 2010, and he was awarded the distinction of National Researcher Level 2. He has published 27 journal articles, coauthored five book chapters and contributed with 68 conference papers. His works in observation, identification, and control of linear and nonlinear systems have been cited more than 1400 times (source: SCOPUS), he possesses h-index=16. Prof. Dávila was guest editor of the Special Issue: “Variable Structure Methods for Hybrid Systems,” International Journal of Systems Science, Volume 42, Issue 11, 2011. And currently is associate Editor of the Conference Editorial Board of IEEE Control Systems Society (since 2016).